Total Choice Hosting Review 2019: Is Total Choice Hosting a Good Hosting? 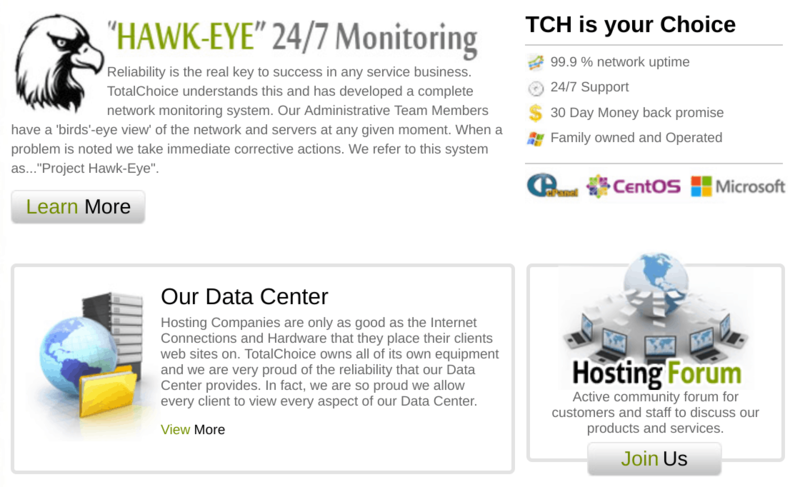 TotalChoice Hosting has been in business since 1999. Originating in an entrepreneur’s garage, this hosting company now serves over 50,000 clients. Originating in an entrepreneur’s garage in 1999, TotalChoice Hosting now serves more than 50,000 clients from their own data center. As a U.S. company, their website and support are in English. This company very proudly owns its own Michigan-based data center that is located in a geographically safe location. It features Cisco routers and switches, has redundant power backup, and is monitored 24/7. Owning their own data center also means that they won’t oversell their resources and they are in exactly the right place to resolve any technical issues. Whilst there is no explicit uptime service level agreement, their displayed third-party monitoring results show an uptime of over 99.9%. TCH sells four shared hosting plans: Starter, Silver, Deluxe, and Gold. The Starter plan comes with 5GB of disk space and 150GB bandwidth, the Silver plan has 10GB disk space and 300GB bandwidth, the Deluxe plan affords you 20GB disk space and 400GB bandwidth, and the Gold plan gives 30GB disk space and 500GB bandwidth. All plans come with one domain (which I find limiting) and unlimited subdomains. They integrate the Softaculous one-click installer, various shopping carts, and website statistics for beginners. And for experts, they support PHP 5 (not the faster version 7.2), Perl, and MySQL databases. Not only can TCH support you with shared hosting when you’re starting out, but also they can help you scale up to dedicated servers or VPS when you’re ready to grow. The prices are okay. They are not the cheapest on the market, but you do benefit from the fact that this company owns its own data center. You can purchase hosting on a variety of contract lengths from one month to three years, and the price is reduced if you purchase a longer term up front. They also have a “no questions asked” 30-day money-back guarantee that might make you feel better about making the initial commitment. There are quite a few additional costs that you need to take into account at the checkout. Domain registration, SSL certificates, and even spam email protection are all added costs. But the setup is free, and they do offer assistance with website migration and SSL certificate installation. I’m pretty impressed with TCH’s customer service offerings. 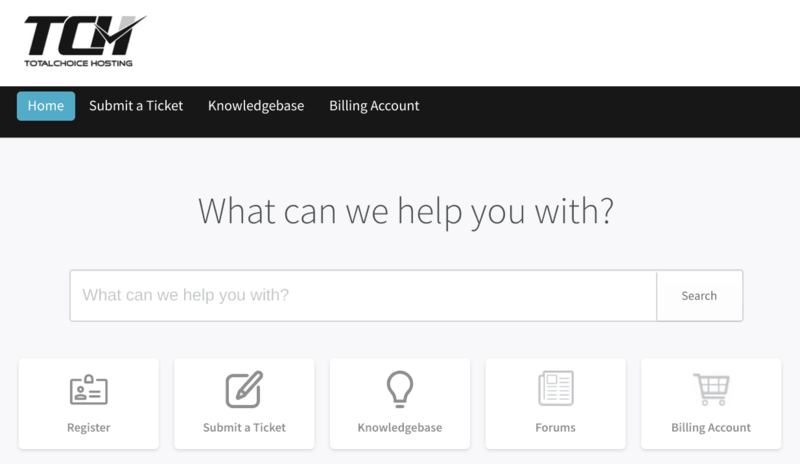 They provide 24/7 technical support by ticket and live chat, along with a set of forums and a knowledge base. I’ve contacted the company a couple of times via live chat, and a polite and helpful operator picked up immediately even in the middle of the night (U.S. time). If you’re looking for an alternative to the large-scale U.S. hosting providers, TotalChoice Hosting could be a good fit. It’s evident that they are really proud of their data center and that they strive to offer top quality services to their clients. Wondering how Total Choice Hosting stacks up against other Web Hosting companies? Enter any other Web Hosting company and we will give you a side-by-side comparison.